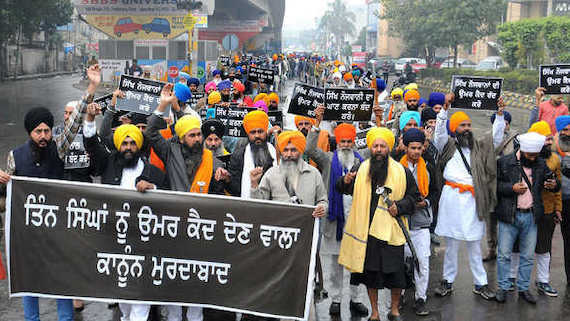 Re-asserting that Sikhs want complete freedom from India, the Dal Khalsa on Indian Independence day staged a spirited protest against the atrocities, political subjugation and denial of right to self determination in the last seven decades. In a press release issued today, the Dal Khalsa maintained that in a rare show of unity Sikh political and religious groups have come together to protest the continuous throttling of Sikh rights and suppressing of our political aspirations for Azadi, since the last seventy years. The district police has booked Sri Guru Granth Sahib Satikar Committee chief Sukhjit Singh Khosa and 12 others under FIR number 22 dated 20/07/2015 under sections 353 and 186 of Indian Penal Code (IPC).